Episode 18: It Keeps Going, Going, Gone! Episode 18 can be found here now. Ash, Brock, and Brenda encounter a new Pokémon named Rabbolt that seems sweet at first, but it turns out that it has problems with Pikachu. Then Team Rocket comes in and takes Rabbolt, and decides to use it for their newest scheme. The Pokédex and Character Guide pages have been updated accordingly. We’ve all been introduced already to Team Planetary, but this episode actually set the pace for future Team Planetary episodes. While this was the first episode to feature Team Planetary that was not based off of an event in Luna, Terra, and Sol, it was not completely made up. Several factors of this episode foreshadowed future events (some of the more avid readers of this website may have been able to make a couple of connections already). This is one of the examples of the fact that I have to write like the show, which means writing as if the games actually do exist, and the audience knows about their story already. What did not come from my game concepts was The Guardian. He is actually inspired by my traditional Ninja Team. 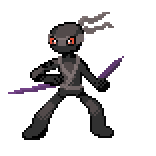 In my Black 2, I created a team of “ninja-like Pokémon,” including Accelgor, Gallade, Lucario, Hitmonlee, Scizor, and Bisharp. I have now recreated that team in Y and Omega Ruby, this time using Greninija, Mega Lucario, Mega Blaziken, Mega Scizor, Bisharp, and Mega Gallade. The Guardian is my way of referencing that team in my story. I’ll promise you now, The Guardian will return. Description: Ninjato are experts in fighting in the shadows. They can create some of the sharpest blades out of pure shadows, which they wield with great skill. In the ancient past, they fought side by side with ninjas. Evolves from Ninjitsu by leveling up while holding the Ninja Scrolls. Trivia: Ninjato’s name comes from the name of a type of ninja sword. As well as being masters of the blade, they are efficient in hand-to-hand combat, and are masters of stealth. While Ash and Pikachu are receiving a tour of Kanaveral City’s Cape Space Center, Team Rocket is breaking into a top secret Team Planetary warehouse, and stealing a prototype superweapon. With this weapon on their side, can anything stop Team Rocket’s rampage across the city? The Pokédex and Team Planetary pages have been updated accordingly. This episode was me taking a stab at doing some social commentary. Every day I go to school, I see all the kids around me stuck in the world of their smartphones, oblivious to everything around them. It bothers me. The part with the Battle Simulator was a separate piece of social commentary, this one aimed at sports-themed video games. I always found it so silly that people would play a football video game when they can go outside and play football for real. I play video games in order to do fantastical things that can’t be done in normal life, not mundane things such as sports. On a different topic, the Pokéssistant is the signature piece of technology of the Tenno Region, similar to the Pokégear, Pokénav, Pokétch, X-Transceiver, and Holo-Caster. It is given to your character in Luna/Terra/Sol when you first arrive in Kanaveral City. It serves a large amount of functions. For further information, check out its new section on New Mechanics page. As I am sure many of you have noticed by now, the Galacerta sprite was a little off when compared to other sprites and not in line with the Pokémon style. After all this time, my brother has kindly provided an updated version, one that fits in much better. Description: Galacerta spend the entire day living inside of caves. Only during the night do they go into the open in order to find food. Galacerta use the starry pattern on its skin to communicate with others. It is believed that Galacerta inspired the constellation Lacerta. Evolves into Serpenstar at level 30. Trivia: Lacerta is a real constellation of a lizard. The larger stars on Galacerta’s body reflect the pattern of said constellation.